Two babies are placed between dolls covered with red paint during a demonstration, most of them women and children, against Israel's military offensive in Gaza, Tuesday, July 22, 2014, in Berlin, Germany. Several hundred pro-Palestinian protesters demanded a halt to military action in Gaza. Photo Credit: The Associated Press, Markus Schreiber. Anti-Semitic protest occurring across Europe are being condemned. The foreign ministers of Germany, France and Italy on Tuesday condemned the rise in anti-Semitic protests and violence over the conflict in Gaza, saying they will do everything possible to combat it in their countries. The three said that while they respect demonstrators' freedom of speech and right to assemble, they will also do everything possible to fight "acts and statements that cross the line to anti-Semitism, racism and xenophobia." Since the outbreak of violence between Israel and Hamas, participants at anti-Israel demonstrations across Germany have frequently used anti-Semitic slogans and also called for Jews to be gassed - a reference to the killing of Jews by the Nazis in the Holocaust. In Berlin on Tuesday afternoon, about 500 pro-Palestinian demonstrators marched from the city's Potsdamer Platz to the landmark Brandenburg Gate, chanting slogans like "Israel is murder" and "Israel bombs, Germany finances." The most direct route for the march would have taken the protesters directly to Berlin's Holocaust Memorial, but police in riot gear steered them well around the monument to the 6 million Jews killed by Nazi Germany. Police had to separate Berlin resident Bernd Wierer from a group of young male protesters after he started arguing with them about their chant: "Israel is fascist." The 70-year-old said he was neither Jewish nor had any connections to Israel, but that Germany's Nazi past made it necessary for the country to be particularly vigilant about anti-Semitic slogans. "They can demonstrate here, I support that, but you can't say those things in Germany," he said. 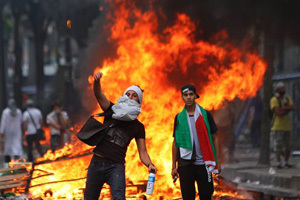 In France, pro-Palestinian youths have clashed repeatedly with police, and on Sunday set fire to cars, pillaged stores and attacked two synagogues in the Paris suburbs. Italy has also seen nonviolent pro-Palestinian demonstrations. Jewish groups have expressed shock and disgust about the growing anti-Semitism in Germany and other European countries with strong Muslim communities. "We have reached a new level of hatred and violence in all of Europe that cannot even be compared to the anti-Semitism seen during previous conflicts in Israel," said Stephan Kramer, director of the European office on anti-Semitism of the American Jewish Committee in Brussels. French President Francois Hollande met Monday with Jewish and Muslim leaders in the Elysee Palace, where he told them that fighting anti-Semitism will be a "national cause." In Berlin, police said Tuesday they had banned pro-Gaza protesters from chanting an anti-Semitic slogan at all protests in the city. Police spokeswoman Cosima Pauluhn also said that they were investigating a sermon last week by imam Abu Bilal Ismail at Berlin's Al-Nur mosque in which he said Jews should be killed. The mosque did not return calls seeking comment. At a pro-Palestinian protest in front of the Israeli embassy in Berlin on Monday, 13 protesters were detained and police were pelted with stones. David Rising in Berlin and Angela Charlton in Paris contributed to this report.